Every Human Being on earth has a particular thing he/she can't barely do without. Addiction is anything that one can not do without it can be good or bad depending on what you are addicted To . 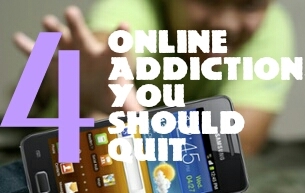 We will be discussing on ' Online addiction that make you lose time,money and energy'. They Data you use online is paid for , The total number of minutes and hours you waste online is time. time is one vital thing successful minds can't afford to lose. Remember Time Waits For No Man and also Time Is Money . 1. Online Gaming - This is common among the young teenagers , A 13-18 years old can hold a control pad(joystick) From Morning till dawn . food or water will seize to be in there world , the only thing that might concern him is data . Online gaming is a very bad addict that can temper with your psychological way of doing things,you will try to reincarnate what you play online which can end up bad for you or others. The energy you burn playing games can be of help to you and the world we live in today. 2. Social Media - Has Social Media Done More Good Than Harm ? Is a question that has been raise several times, social media has done some good things in our today's world. Social media also have a bad side , some individual can not do without Facebook, Instagram , Twitter , Snapchat and whole lot of others.Being Social is not bad but they way people go about it is what makes it bad . What Profit is there if you waste your time and resources on social medias.Some people can tell you what Kim kardashian ate for breakfast , lunch and dinner , where she went to , with who she went out and how she went there because are always online , clicking , viewing and following events as the unfold . 3. Online Shopping - This is for the rich guys who are natural talented or let me say addicted to shopping they can shop from money till night so far as money is there and new products are emerging.Is not that the need what the shopped for they shop for fun and find shopping interesting is like there hubby. 4. Reading Stories Onlin - Where are the story freaks in the house ? Some people join online stories board just to read e-novels a complete 400+ novel that Is divided into seasons and episodes . Why Waste Such precious times reading a fictional work of art when you can read your textbooks and get good grades.How can you write 300+ Episodes of story with each episode containing 1000words . Addiction is a bad character that should be stopped at all cost . Get ride of all addictions and safe precious time , energy and money. You can start by distancing your self and any other thing that make you do what you don't want.Mind the kind of friends you keep if they are online addicts try to pave a gap between them and yourself.